Here's a few health tips to keep in mind this winter season. (NEW YORK) — It may not be a polar vortex but weather forecasts are calling for heavy snowfall, ice and freezing temperatures for much of the country later this week. The weather is not only a headache for commuters but it can also be a danger to those spending too much time outdoors. Frostbite can appear within minutes. Cold temperatures and icy wind means an increased risk of frostbite. Dr. Edmundo Mandac, director of emergency medicine clinical operations at University Hospitals Case Medical Center in Ohio, said it might “take only a minute or two” for people to develop frostbite symptoms in below-freezing temperatures. Even after you’ve warmed up after a hot cup of tea, Mandac said it still may not be safe to go outside since tissue is “more susceptible” to frostbite on a second trip outdoors. Shoveling snow can be hard for your heart. 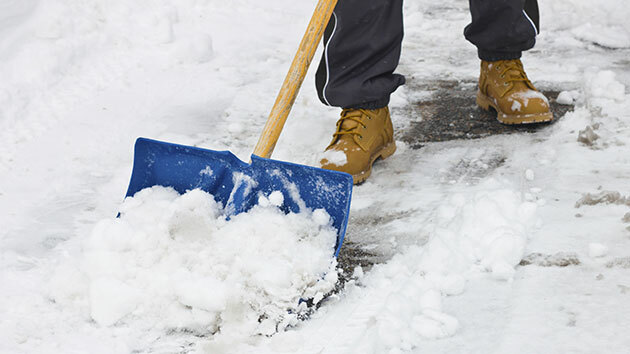 Shoveling snow is often a necessary chore during a blizzard, but this is one chore you might want to avoid until the weather warms up. The American Heart Association explains that cold weather and strain of shoveling snow has been associated with a risk of heart attack. Mandac points out that cold temperatures put extra strain on the body, which can be a recipe for disaster. “You’re trying to warm up — trying to shiver — and throw in physical activity and most people are not in good physical shape,” he told ABC News. Mandac said anyone who doesn’t feel up to shoveling snow physically, should not try to push themselves. “If you’re not sure about your health … don’t try to shovel snow,” he said. Mandac also points out that alcohol, along with some other medications, affect how the body regulates temperature. As a result, it might make a person more susceptible to the cold weather. Be aware of hypothermia risk and check on elderly family members. In his emergency room, Mandac said he has seen people arrive suffering from severe hypothermia, with body temperatures below 90 degrees Fahrenheit. He said while some patients may have been stranded in the outdoors, other patients have become hypothermic even while in their homes. “Older people, who either because it’s not warm enough for them at home or they have medications they take and can’t tell what the temperature is, they can become hypothermic even inside the house,” Mandac said. As people age, it’s harder for their bodies to regulate temperature, he noted. If the power goes out or the heat doesn’t come on, it can have dangerous consequences for elderly residents. The U.S. Centers for Disease Control and Prevention also gives advice on how to heat the home safely. The CDC advice includes keeping space heaters at least 3 feet from anything that can catch fire, not using an extension cord for a space heater and keeping a carbon monoxide detector around. The CDC also advises against using generators, grills or camp stoves as a heat source because they can generate deadly carbon monoxide gas.